Feed your senses at the 110-seater, world-class dining experience, where decor meets a whimsical fusion of intercontinental flavours and cooking techniques. Designed with the ultimate dining experience in mind, the clean lines and spacious layout of the March Restaurant are sophisticated elegance personified. Breakfast is served from 06h30 to 10h30 Monday to Friday and 06h30 to 11h00 on Saturdays & Sundays. A-la-Carte Lunch begins at 12h00 daily and continues with Dinner until 23h00 each evening. Sink into the inviting leather couches and sip on a whiskey or cognac whilst you indulge yourself in the company of some of the greatest authors of the world. Open 24 hours. Indulge your colonial side while sitting back and watching the world go by. Savour the moment with a steaming cappuccino and delicious bite to eat. Open 24 hours. Where tables can be found nestled comfortably in the shallow water, alongside oversized metal buckets planted with trees. The 60-seater poolside bar operates from 09h00 to 19h00 daily. You may also dine in the pool, but reservations are recommended. 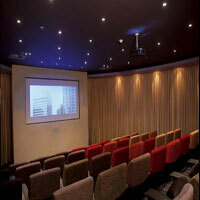 Surround yourself with the finest audio-visual entertainment in our luxurious and private Sound Room. Indulge all your senses as the plush furnishings, warm ambience, quality visuals and sounds transport you to another world. Open 24 hours. (Reservations are recommended). Drink in the unforgettable aromas and flavours of the finest coffees in the world, all made to order with a personal touch. Indulge in the finest range of wines, imported malts and cocktails in a relaxed atmosphere. 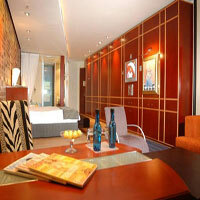 Our passion for style and luxury permeates every part of the Melrose Arch Hotel. You will find evidence of it in every GUEST area. 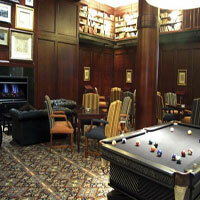 The Hotel resonates with a vibrant, up-beat atmosphere and extensive facilities cater for every mood and taste. Every one of the 118 rooms at the Melrose Arch Hotel offers an opulent blend of modern decor with warm natural tones and luxurious personal touches. The sleek lines of the designer furniture are beautifully complemented by relaxing ambience and mood-enhancing lighting. Considering the stylish luxury of every deluxe room, you'll be forgiven for wanting to spend a fair amount of time indoors and the unique features of our generously appointed accommodation make it possible to do just that. Apart from sumptuous luxury, each room comes standard with a host of first-class business and leisure amenities. Original art, ergonomically designed furniture and high-tech facilities make the Melrose Arch Hotel Business Centre the perfect world-class setting for highly effective executive meetings and conferences. With five state-of-the-art boardrooms, full secretarial and business services, a PC with printer, ISDN lines and two Internet kiosks, the Business Centre is open 24 hours a day, 7 days a week. The pool area is on the same level as the conference floor, making it the perfect setting for tea breaks (weather permitting).